Localization is a very important concept. Generally when you write a application or create a website you do it in a particular language Eg. English. But customers of your application/website may be from different country understanding different languages. In fact English itself has may variation. For Eg. you have US English, British English, Indian English etc To make you application/website dynamic to the customers locale understanding and implementing Localization is very important. In this post I will show basics of localization , classes used in Java. I am not providing output for above as the list is big. Lets see a shorter version of this. Lets see all locales of languages english. Before that's lets understand locale. 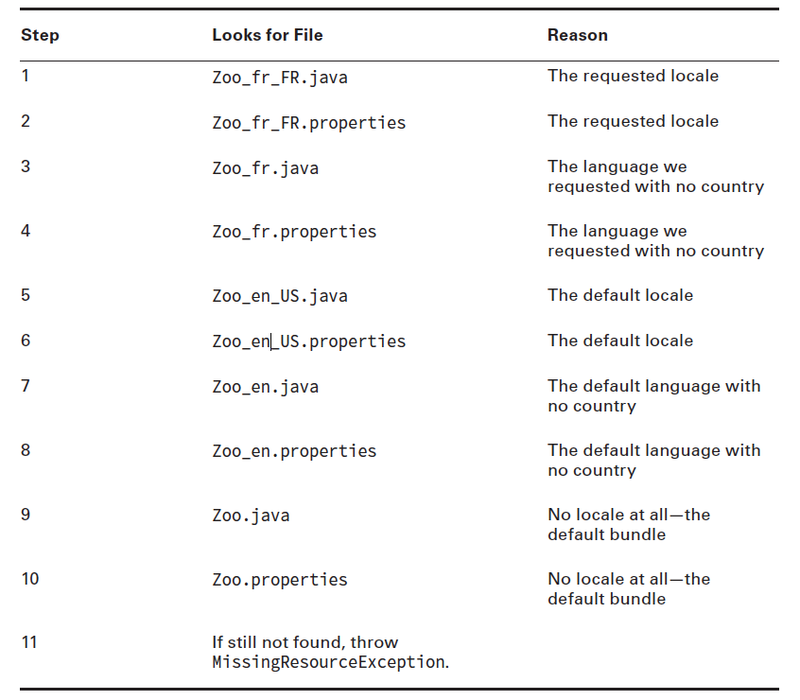 you can imagine locale as language specs that people of certain region understand. You can identify locale as (language + country +variant [if any]). Consider variants as same language different variation. In terms of databases this is the primary key. We will see this in more details in some time. But for now lets come to Locale class. So I was saying following code will show all locales of english language (but different country or variants if any). Resource Bundles are entities used to map keys to values in different locales. We can simply load or get a resource bundle and then call get on some key to get the locale specific value and show it to the user. We will see this in detail code in some time. In PropertyResourceBundle we essentially provide property files - one for each locale containing locale specific values. When this resource bundle is loaded and get is called keys from the property file corresponding to locale supplied is fetched and returned. In ListResourceBundle property file is replaced by Classes. classes that extend ListResourceBundle class and override getContents() method, which returns an Object . Add following content in propertied file. HW = "Hello World in English!" HW = "Hello World in French!" HW = "Hello World in Italian!" HW : "Hello World in English!" HW : "Hello World in Italian!" HW : "Hello World in French!" 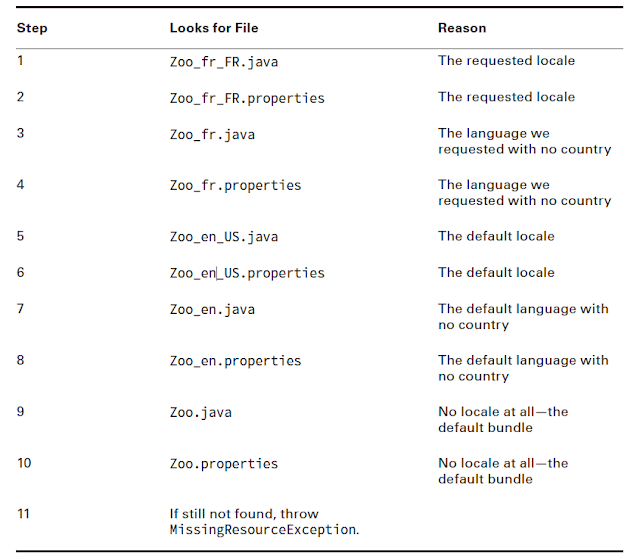 Note : If properties file are not in the path or key is not found then MissingResourceException is thrown. Resource Bundle is loaded in same way as Property resource bundle. Note 1: However in case of ListResourceBundle you call resourceBundle.getObject("ABC") and the call returns an Object unlike the case of PropertyResourceBundle which returns String. Note2 : Make sure Resource Bundle classes that extend ListResourceBundle are public as java uses reflection to load these classes. You can use a value type that is not a String. You can create the values of the properties at runtime. The resolution starts by searching for an exact match for the resource bundle with the full name. If there is a tie between properties file and java file, java resource is given preference. The last part (separated by _) is dropped and the search is repeated with the resulting shorter name. This process is repeated till the last locale modifier is left. The search is restarted using the full name of the bundle for the default locale. Search for the resource bundle with just the name of the bundle. If all the above fails , then MissingBundleException is thrown. NOTE* : Java isn’t required to get all of the keys from the same resource bundle. It can get them from any parent of the matching resource bundle. A parent resource bundle in the hierarchy just removes components of the name until it gets to the top. Note : The getBundle() method takes a ResourceBundle.Control object as an additional parameter. You can extend ResourceBundle.Control class, override getCandidateLocales() method and pass it's instance to the getBundle() method. By this you can change the default resource bundle search process. You can even read from other file formats (Eg. XML files). After you get an instance of above concrete classes you can call format() method to get locale specific string representation of data. If you want data back you can use corresponding parse() method. 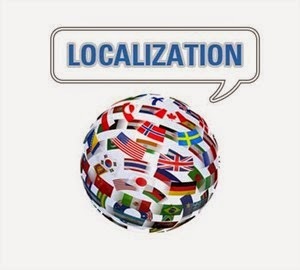 Note : Localization(l10n) and Internationalization(i18n) are two different concepts. Internationalization is the process of designing and building an application to facilitate localization. Localization, in turn, is the cultural and linguistic adaptation of an internationalized application to two or more culturally-distinct markets. For more on this see SO question in related Links section.